Today, tens of millions of patients each year are diagnosed and treated with accelerator-based radioisotopes. In 1930, Ernest Lawrence observed a curious aspect of his new atom-smashing accelerator, the cyclotron: The decaying isotopes it produced continued to emit gamma rays long after emerging from the collisions that produced them. When Ernest told his brother John, a physician, about the radiating isotopes, the field of nuclear medicine was born. In the postwar years, the technology burgeoned into a widely recognized cancer-fighting tool. Today, tens of millions of patients each year are diagnosed and treated with accelerator-based radioisotopes. While radioisotopes with long half-lives are often formed in nuclear reactors, more than 300 cyclotrons across the United States produce short-lived isotopes for hospitals. The cyclotrons work by spiraling charged particles such as protons around a magnet, outward from the center. To produce the isotope fluorine-18, for example, when the particles reach an energy of about 10 million to 15 million electronvolts they slam into a water target enriched with the oxygen-18 isotope. The resulting fluorine-18 isotope is chemically separated and combined with a sugary glucose compound that is ready for delivery to the hospital or clinic. The process takes as little as a few minutes. With a 110-minute half-life, 18F has wide use in diagnostic imaging. The 18F glucose compound is an energy source for cells in the body. Administered intravenously, the compound collects in areas of high metabolic activity, such as cancerous tumors. 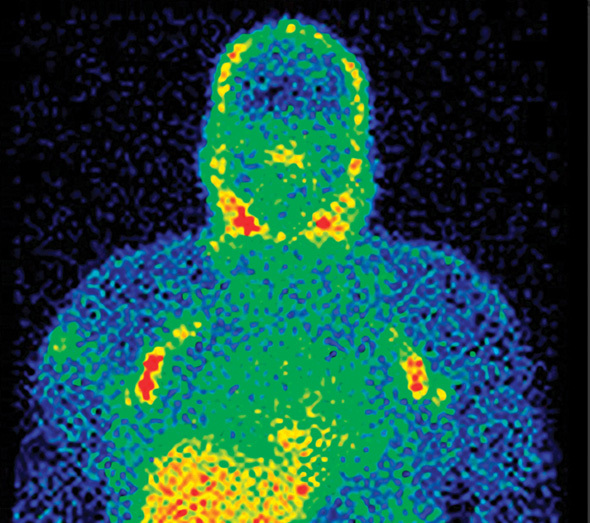 Then a positron emission tomography (PET) scan of the emitted gamma rays provides detailed three-dimensional images of the cancer. Some radiotherapy treatments implant metallic radioisotope seeds with relatively long half-lives directly into a tumor, where the emitted gamma rays destroy the cancer cells. Due to its extra-long half-life of 66 hours and its ability to produce a shorter-lived daughter, the most popular isotope for diagnostic imaging is molybdenum-99, or Moly-99 for short. Produced abroad by only three nuclear reactors devoted to radioisotope production, Moly-99 is involved in more than 50,000 procedures worldwide each day. Physicists hope to develop accelerators in the United States to reliably mass-produce Moly-99 and other radioisotopes. Click here for the "Applications" archive.